Meanwhile, radical Shiite cleric Muqtada al-Sadr met in Najaf with Iraq's most influential spiritual leader Grand Ayatollah Ali al-Husseini al-Sistani for the first time since al-Sadr launched an uprising against the U.S.-led coalition in April. Najaf and Kufa were calm as Iraqi police extended their control there after a deal announced Thursday to remove gunmen loyal to al-Sadr from the streets. Elsewhere, however, violence persisted, underscoring the grave security threat facing occupation forces and the new interim government set to take power June 30. Iraq's new prime minister, Iyad Allawi, said Saturday the United States will hand over all Iraqi detainees — including Saddam Hussein — to the new Iraqi government after it assumes sovereignty at the end of this month. Iyad Allawi said all the detainees will be received and put on trial. Allawi repeated that he expects Iraq to receive full sovereignty at the end of this month, despite the continued presence of tens of thousands of foreign troops. He has called for a halt on attacks on Americans and other foreign soldiers, saying their presence would be needed even after the transfer of sovereignty to help the new leadership improve security. Allawi also criticized the U.S. decision last year to disband the Iraqi army after Saddam Hussein's regime collapsed. Secretary of State Colin Powell said Saturday that Iraq's new prime minister has written a detailed letter to members of the U.N. Security Council spelling out the relationship between the new Iraq interim government and U.S.-led military forces. Powell said the Allawi letter makes clear that Iraq wants a coalition military presence to remain. He called it "a recognition that they can't provide for their own security yet." U.N. Security Council members have been working on a new resolution on the handover of sovereignty to Iraq. Powell said Allawi's letter goes a long way to meeting the concerns of Security Council members over military arrangements. France, which has veto power on the council, has stressed the need for Iraq's government to have authority over its security. CBS News Correspondent Mark Knoller reports that Powell said a U.N. deal could be nailed down in the next couple of days. In Powell's words: "We are very very close." Saturday's roadside bombing, which occurred in eastern Baghdad, was the second fatal attack against American troops in the capital in as many days. Five U.S. soldiers were killed and five wounded Friday in an ambush near the Shiite neighborhood Sadr City, an al-Sadr stronghold. Elsewhere in Sadr City, Al-Sadr's militiamen attacked an Iraqi police station and American soldiers guarding the building returned fire, wounding at least one militiamen, witnesses said. Assailants also ambushed two civilian sport utility vehicles, favored by Western civilian contractors, on the road to Baghdad's international airport. An Iraqi Interior Ministry official, speaking on condition of anonymity, said two or three people were killed but he had no further information. Another civilian car carrying Westerners was attacked Saturday in the northern city of Mosul. Police said one civilian was killed and three others were injured but they refused to identify them by nationality. A rocket-propelled grenade also hit an Iraqi army recruiting center in Mosul, wounding 17 people, according to hospital officials and police. Attacks against such facilities appear aimed at discouraging Iraqis from joining security services, which are expected to take on a greater role in fighting insurgents after the transfer of power. Late Saturday, residents reported an armed clash in Fallujah, the restive Sunni Muslim city that was the scene of heavy fighting between Marines and insurgents last April. However, a coalition spokesman said no U.S. personnel were involved in any action in the city. Al-Sadr briefed al-Sistani on the plan announced Thursday to pull back Shiite militiamen and U.S. forces from Shia Islam's holiest shrines, said Ahmed al-Shibani, a representative of al-Sadr's office said. Al-Sistani "has thanked (al-Sadr) for his efforts ... to peacefully resolve this crisis," al-Shibani said. "The agreement is moving is toward success and is on the right path." The 30-year-old al-Sadr has been eager to win the support of al-Sistani - an older, more moderate cleric who commands broad respect within Iraq's Shiite majority. Al-Sistani for his part has been eager to avoid a U.S. assault on Najaf and to prevent internal rifts among Iraq's Shiite majority, which is hoping to take power in national elections in January. The session in al-Sistani's office lasted about 10 minutes, his guards said. Al-Sadr's rebellion began in early April after the U.S.-led occupation authority closed his newspaper, arrested a key aide and announced a warrant for his arrest in the April 2003 murder of a moderate cleric in Najaf. Under a deal worked out between Shiite leaders and al-Sadr's militia, his al-Mahdi Army is supposed to pull back from the Islamic shrines in the twin cities and hand over security to Iraqi police, according to Najaf Gov. Adnan al-Zurufi. At the governor's request, the U.S. Army agreed to stay away from the Imam Ali Shrine in Najaf and the mosque in Kufa where al-Sadr preaches to give Iraqi security forces a chance to end the standoff. By midday Saturday, al-Sadr's fighters remained at the most sensitive religious sites but were no longer brandishing weapons, an aide to the cleric said. 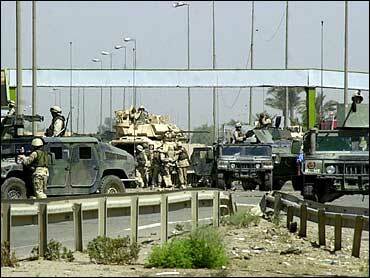 Iraqi police were seen taking up positions in the city but were avoiding the area around the Imam Ali Shrine. The deal falls short of U.S. demands that al-Sadr submit to arrest and disband his militia. Those conditions are to be resolved later in talks between al-Sadr and the Shiite clerical hierarchy.